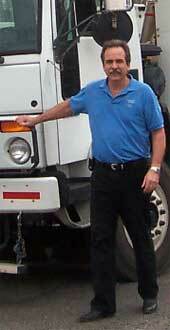 Jim Larko has over 20 years of industry experience. You'll find a host of great ideas and concepts in our interview with him. Katsam owns a dozen sweepers, with eight of them being run on daily routes. Although historically the company has performed both street and parking area sweeping, Larko said they are leaving the street sweeping portion. "There's a general lack of construction sweeping, since construction has completely died down in our area," says Larko. "And, the bids for municipal sweeping are getting too low to make sense. To municipalities, we are just a number and have no opportunity to differentiate our work quality from that of a low bidder that does not have the same work product we do." Larko recommends that, especially in this economy, you streamline your company by figuring out what you do best and concentrating in those areas. It's that type of thinking that is pushing him out of street sweeping. Seeing that the wave of the future is in the greening of the economy, one area the company has moved into is pressure washing with reclamation. This will complement their current pressure washing operations. "We're seeing more and more interest in getting the dirty water up in an environmental manner when doing pressure washing," Larko relates. "We have recently purchased a Nilfisk-Advance machine called a 'Cyclone,' which does a great job. Even so, we're pushing it to the maximum with some of the garages we're cleaning, ones that haven't been cleaned in 3-to-5 years. We think this kind of machine and the job it does is the wave of the future, though, and our clients agree." In his audio interview, which runs 35 minutes, Larko also discusses what the changes in diesel technology will mean for sweeping contractors. These changes will bring as yet unknown challenges to those who run the newer chassis. That's one of the reasons, he says, that he's now considering the new gas/gas twin-engine sweeper from Victory Sweepers. "Whenever we get a new sweeper, I try to buy the equipment that currently is the best for us and our present situation. I think it's important to keep up with the changes in equipment along with everything else in the industry." Larko also discusses why he thinks diversification is important, especially in this type of economy. He has started a professional window washing service as the latest component of service Katsam offers, as an example. "Again, continue to grow but not all in one basket," he cautions. "Anytime I'm talking to a customer I ask them if there's anything else we can do for them. I find out if they're having trouble finding a good contractor for any particular need. That lets me know where areas of opportunity are, and where I can best help out my customers. "And," he continues, we make whatever arrangements are needed with other area contractors to get accomplished what our customers need done. With the reduced manpower in the property management industry, some of our customers simply can't see over their desks. We do what it takes to help them and they appreciate it. That's important in the long run." In the audio, Larko also provides an analysis of working with national providers, sometimes called 'aggregators.' If you are even considering signing a contract with a national service provider, you won't want to miss this portion of the interview. Note: The following audio interview with Jim Larko, which is approximately 35-minutes in length, will play without downloading any files onto your computer. If you hear the interview at 'chipmunk speed,' you will need to download the latest version of Adobe's free Flash player. The company may be reached via email, or by calling them at 314.524.6939. The company's website is www.katsam.com/.